If you have been lucky enough to be part of the generation ‘x’ where their Saturdays preceding Halloween are spent watching Noli de Castro and his ever infamous Magandang Gabi Bayan Halloween special, or you have become one of the pioneers of gen ‘y’ with which watching studio 23 horror specials and even Korina Sanchez’s Balitang K all souls day features have been a staple tradition; then this house is a no stranger to you at all. 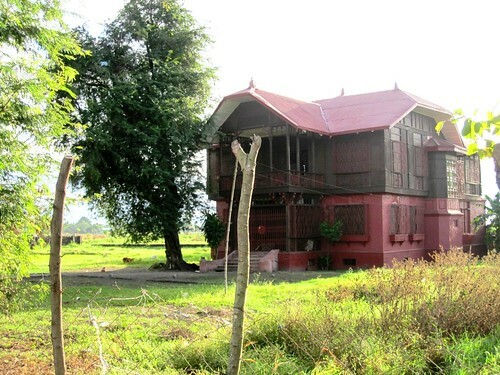 It is the infamous Ilusorio Mansion or much known as the Bahay na Pula. an epitome of an elegant yet haunted mansion very much attractive to the very ‘matatakutin’ (frightful) Pinoy. situated in the boarders of San Ildefonso and San Miguel in the northern part of Bulacan province, its grandeur has become a permanent stature in the area beaming with elegance and a stylish ‘espanyol’ look that amazes everybody that pass by this house. yet with its elegant facade also equals the eerie feeling that haunts those who know its dark history. this house according to history books was one of the houses in quested by the Japanese forces during World War II to be used as their garrison wherein reportedly Japanese soldiers massacred Filipino guerillas. with that this house also became the penitentiary of those unfortunate comfort women (women raped by Japanese), mostly Bulakenyas and Nueva Ecijanons. locals claim that at night they would hear screams of women crying for help. others would say that they would hear men talking at night in an unknown language (most probably japanese). Just take any bus enroute to Nueva Ecija or San Miguel Bulacan and request the ‘kundoktor’ to drop you at the bahay na pula. this is just beside the highway and is very visible by the road. the author of was not able to provide photos for the interior of the house due to unavailability of his SLR and an eerie but quite funny experience with an old man who begged for coins. he got scared thats why he thought of taking more photos some other time and left the place immediately. LOL.